Grégory Leclair began his training at the regional Conservatoire of Clermont-Ferrand, France, in the class of Jean-Pierre Billet. From 1993 he pursued his studies at the Conservatoire Supérieur de Paris-CNR with Pedro Ibanez. At the same time he completed his training at the University Paris – Sorbonne, the Schola Cantorum and at the Conservatoire National Supérieur de Musique de Paris (CNSMDP), by approaching fields as diverse as musical acoustics, improvisation with Alain Savouret, musical analysis and orchestration with Jacques Casterede and Alain Louvier, and orchestral conducting with Nicolas Brochot. At the Ecole Normale de Musique de Paris (ENMP) he received a concert performer advanced training with the renowned teacher Alberto Ponce. Avid to meet high musical personalities he participated in numerous master-classes within of which he could benefit from advices of guitarists such as Roland Dyens, Pablo Marquez and David Tanenbaum, violinists Agustín León Ara, Jean-Jacques Kantorow and Ann Wallström (baroque violin), as well as of the lutenist and baroque guitarist Sven Åberg. In 2010 and 2012 he attended the Lucerne Festival Academy in orchestral conducting with Pierre Boulez. In 2002 and 2003 he received a grant from the Spanish Ministry of Culture to participate in the Curso Universitario International de Música Española de Santiago de Compostela with José Luis Rodrigo. In 2003 the French Ministry of Foreign Affairs and the Swedish Institute delivered him a grant to study at the Royal College of Music in Stockholm (Kungliga Musikhögskolan), Sweden, with Mats Bergström, and to approach more particularly the contemporary repertoire with Magnus Andersson. He afterward completed his training with Carlo Marchione at the Conservatorium Maastricht, Netherlands, and did a training course in pedagogy at the Conservatoire royal de Bruxelles. Grégory Leclair performs regularly in concert in numerous countries of Europe (Sweden, France, Germany, Italy, Spain, etc. ), as well in soloist as in chamber music. In 2003 he was invited to share the poster with the pianist André Gorog, participated in Paris in the 5th Festival Musique du Coeur au Marais, performed at the Maison de l’Europe, as well as in the Carnavalet museum. In 2004 he appeared during the 2nd International Guitar Festival Nova Camerata dei Bardi in Italy. 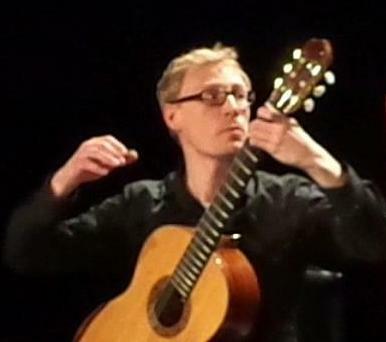 He performed in Brussels in 2009 as part of the Krejcí – Leclair Guitar Duo. His very complete musical training allows him to approach a repertoire which last from the renaissance to the contemporary music. He counts among his chamber music partners the cellist Mateusz Kwiatkowski, the flutists Di Feng (Shanghai Opera House Orchestra, Orchestre de Flûtes Français) and Isabelle Pierre (Opéra national de Paris). He collaborated with several composers including Michel Petrossian (Armenia, France). Grégory Leclair taught at the regional Conservatoire of Clermont-Ferrand from 1993 till 1998. For any purpose please use the latest available biography.